In 1745, a Scotch-Irishman named Richard McAllister purchased the tract of land upon which the original town of Hanover was built. McAllister was a Presbyterian who had recently migrated from the Cumberland Valley. Hanover at that time was covered with a dense forest of hickory, walnut, and oak trees. M’Calister erected a log house at what is now the corner of Baltimore and Middle streets, and opened a store and tavern. In 1763, McAllister divided his farm into lots and founded the town of Hanover. German settlers nicknamed the settlement “Hickory Town” after the thick groves of hickory trees that grew in the area. 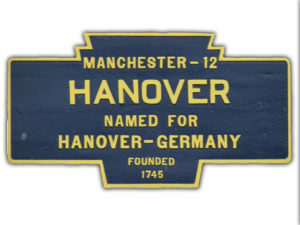 The name Hanover was suggested by Michael Tanner, who was one of the commissioners who laid out York County in 1749 and owned large tracts of land southeast of the town. Tanner’s choice of the name came from the fact that he was a native of Hanover, Germany. The town’s founders, who wanted to please the German settlers, agreed to the name. Hanover was also sometimes referred to as “McAllister’s Town” in its early years. At the start of the Revolutionary War, Hanover consisted of about 500 homes, most of which were built out of logs. After the war, the population increased steadily until the War of 1812. At the time of the advance of the British on Baltimore in 1814, Hanover and vicinity furnished two companies of infantry commanded by Captain Frederick Metzgar and John Bair. These two companies left Hanover on foot Sunday morning, August 28, 1814, and reached the city of Baltimore at 9 A.M., Tuesday. September 11, where they were marched to North Point, spending that night on their arms, and next day, the memorable September 12, 1814, they took part in the engagement with the British, who retreated soon after. The Hanover Companies together with other companies from York County, returned home after two weeks’ service, not being needed longer. After the War of 1812, the town experienced only minor growth until 1852, when construction of the Hanover Branch Railroad to Hanover Junction was completed. In 1858 the Gettysburg Railroad opened a railroad link westward to Gettysburg. The Hanover and York Railroad completed a rail line to York in 1876. During the American Civil War, the Battle of Hanover was fought on June 30, 1863. Union cavalry under Judson Kilpatrick encountered Confederate cavalry under J.E.B. Stuart and a sharp fight ensued in the town and in farm fields to the south, particularly along Frederick Street. The inconclusive battle delayed the Confederate cavalry on their way to the Battle of Gettysburg. Three days before the battle, another detachment of Virginia cavalry had briefly occupied Hanover, collecting supplies and horses from local citizens. The sculpture Sentry, erected in Center Square in 1904, shows a Union cavalry soldier on sentry duty. Over the years, its industries have included the making of cigars, gloves, silks, flavine, water wheels, flour, shirts, shoes, machine-shop products, furniture, wire cloth, and ironstone grinders. The town has lent its name to a brand of canned vegetables, and a mail-order gift company based there. Hanover’s first newspaper, Die Pennsylvania Wochenschrift, was published in German in 1797. In 1805, the “Hanover Gazette” followed suit, also published in German. The citizens celebrated the 150th Anniversary of The Battle of Hanover in 2013. A town committed to it’s people, Hanover remains a safe and happy community celebrating the future as well as the past. Downtown revitalization is a current priority, working with community members and organizations such as the Chamber of Commerce to reconnect with the appeal of the downtown and ignite that hometown character once again. Hanover Borough was designated an official Keystone Main Street on May 30th, 2014.